Ayatollah blasts President Trump's plans to broker peace between Israel, PA, says Israel will disappear, leaving only Palestinian state. The Supreme Leader of Iran, Ayatollah Ali Khamenei, vowed that the US would be unable to broker a peace deal between Israel and the Palestinian Authority, and that the Jewish state would ultimately disappear from the Middle East. 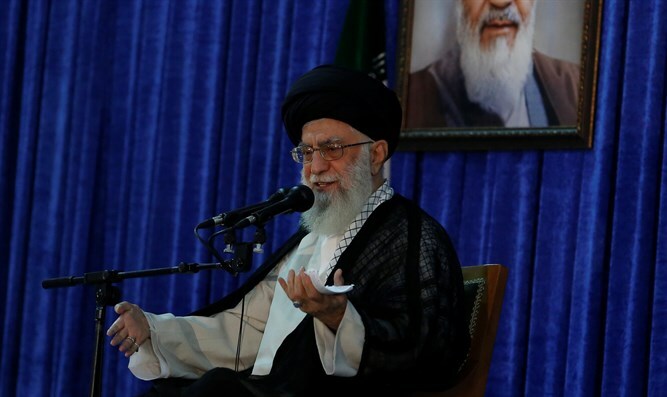 Speaking at a meeting of Iran’s Hajj organization on Monday, Khamenei addressed President Donald Trump’s ambitions to reach an historic accord between Israel and the PA, an agreement he dubbed the “deal of the century”. “To America’s dismay, the Palestinian cause will never be forgotten and al-Quds will remain the capital of Palestine,” said Khamenei. The Iranian leader chastised Muslim states which he said had yielded to American pressure regarding Israel. Ultimately, Khamenei predicted, the Jewish state will disappear from the Middle East. Late last month, a close aide to Khamenei warned that Iran was prepared for a war by proxy with the US and Israel. “The Americans and the Zionists are the major threats that may wage a proxy war in in the region,” said the official, Major General Yahya Rahim Safavi, according to the Mehr news agency. On Sunday, explosions were reported outside of the northern Syrian city of Aleppo at an airbase used by Iranian forces deployed in Syria. The attacks, attributed to Israel, killed 22, including 9 Iranian soldiers, Arab media outlets claimed. Israel has not confirmed that it was responsible for the airstrikes.